What’s the best way to store my bike? I received an email from one of my regular readers Tamara last month who put in special request for me to write a post about bike storage. So this one’s for you Tamara. You may already have your own storage sorted but hopefully this will help others. 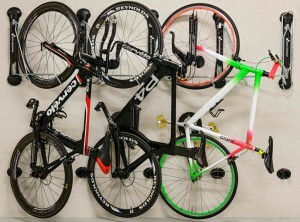 There seems to be two major issues with bike storage – space and security. There’s also the question of weather protection, but for most of us it seems to be important to maximise the use of space, and to ensure that your precious stead is secure. So I’ll address the issue of space firstly. Even if you’re lucky enough to have plenty of space you’ll still need to be organised. My partner and I keep our bikes in our secure garage but with eight bikes between us we still need to maximise space. We have several bikes that hang from the rafters and my bikes (I’m shorter than him) are on the floor and held in place with PRO brand bike stands that hold the back wheel in place. 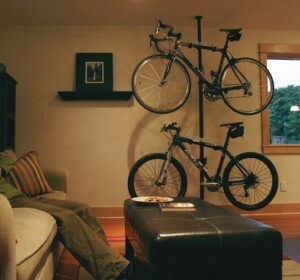 For hanging bikes there are heaps of options which can hang from the ceiling or wall or even be free-standing like the Topeak Dual Touch Bike Stand which is a pole that anchors from the floor to ceiling without any holes needing to be drilled. It’s a great option for renters. It can be extended to 320 cm and hold up to four bikes. If you can drill holes then I really like the Steady Rack products which allow you to hang your bike vertically against a wall. It folds away neatly when you’re not using it. 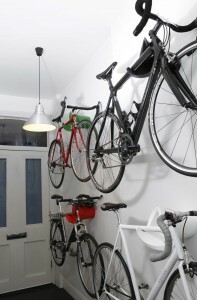 You can even hang several alongside each other to really maximise your use of space. If you want something that looks really cool as well as functional then you can’t go past the Cycloc products but you will have to drill a few holes and use some pretty strong fixtures depending on the type of wall you’re drilling. And if you don’t like these suggestions there are literally dozens more of these types of bike racks on the market. I’ve seen track systems that you can by at storage retailers like Storage World or hardware shops, or even just large hooks that fit to a ceiling or wall. You just need to assess you own situation and go from there. Security is also something you need to consider carefully. I’m lucky enough to have a secure garage with an alarm system so I don’t have to lock my bikes up when they are at home. But if you don’t have this level of security then you should make your own assessment and buy the appropriate locks for your situation. If your bike needs to be in an area that is shared with others, particularly if you don’t know them, like a common area in an apartment block, then you need to invest in some heavy duty locks. There are quite a few kinds of bike lock available. They come in key or combination varieties and range from a very basic cable lock right up to the heavy U-locks. You have to decide what works best for you based on where you plan to lock your bike, what type of bike you have, how much it’s worth, and what weight you want to carry around. Abus locks has a good summary on its website. 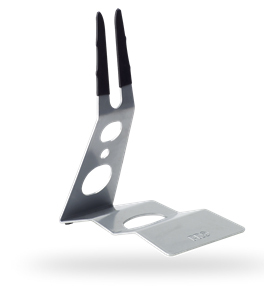 Ideally you want the lock to be attached to something very solid like a strong pole or bike rack and then to you bike. Even if your bike is a locked area, like a caged area in an apartment block car park, you should consider some sturdy locks. I’ve heard heaps of people tell me they’ve had their bikes stolen from a locked cage area. The final issue I’d like to address is whether you should keep your bike outside. Ideally a bike should be stored undercover and away from an area where it could be exposed to rain. If you don’t have a garage or even garden shed then a spare room inside a house or apartment is preferable. However, I know that this is not always possible. If you have to keep it in a carport or on a balcony then a bike cover can help shelter it. These are relatively inexpensive plastic or canvas covers that go over the bike and protect it. It’s not ideal but it’s better than leaving it exposed and it is better for security if passers-by can’t see what type of bike is under the cover. And always lock it up as well. I’d love to hear from others about their own bike storage ideas. Share via Facebook or Comments.